The specific facts surrounding the citizenship of Elizabeth Taylor may never become public knowledge. She was not born in the U.S. and hence did not receive U.S. citizenship via the 14th Amendment. She was born in London, England in 1932 to U.S. citizen parents and hence obtained derivative U.S. citizenship via her parents. 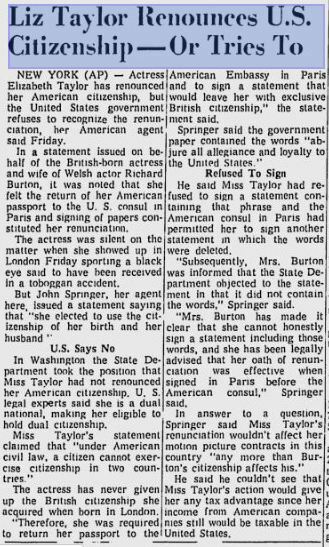 Ms. Taylor apparently tried to renounce in Paris at one point, unsuccessfully when married to Richard Burton around the time she won the Oscar for Who’s Afraid of Virginia Woolf?. There were various newspaper reports published in the 1960s about how she first attempted to renounce (unsuccessfully) and then later successfully renounced while married to Richard Burton. Elizabeth Taylor reportedly reacquired her U.S. citizenship later in 1977 when then married to John Warner who served six terms in the U.S. Senate and was the Secretary of Navy and now practices law. This entry was posted in Famous People, Immigration Law Considerations.